A few months ago I attended the VMware vCloud: Deploy and Manage the VMware Cloud v1.5 course but after the training I didn’t have any chance to put my knowledge into action until now. Recently I’ve got a question from one of our customers about vCloud Director features and possibilities so we have decided to create a proof of concept (POC) environment and let them explore this product to see if it offered the solution they were looking for. In the upcoming blog series I will walk you through building a small POC for a VMware vCloud Suite implementation. But first, let’s summarize what vCloud Suite actually is. The VMware vCloud Suite is a complete, integrated cloud solution that accelerates service provisioning while simplifying IT operations and delivering the best SLAs for all applications. This integrated product offering includes all the elements to build a complete cloud solution and to operationalize customers’ VMware vSphere virtualized environments. I have created a small infrastructure with all components running as virtual machines for the POC. I’m not going to explain how to create a basic HA/DRS cluster because it is out of scope of this article and it is really basic stuff except the use of a distributed virtual switch, which is recommended for a vCloud Director deployment. I also configured a Storage DRS cluster with 3 datastores and assigned a user defined storage capability. Also, make sure SSL certificate checking is enabled in the vCenter Server. So, let’s get started and create the first vCloud Director Cell. Click here to continue to part 2. I really like your writeup, and trying to replicate in my home lab. I am unsure how to config the networking part of the nested virtual ESXi. 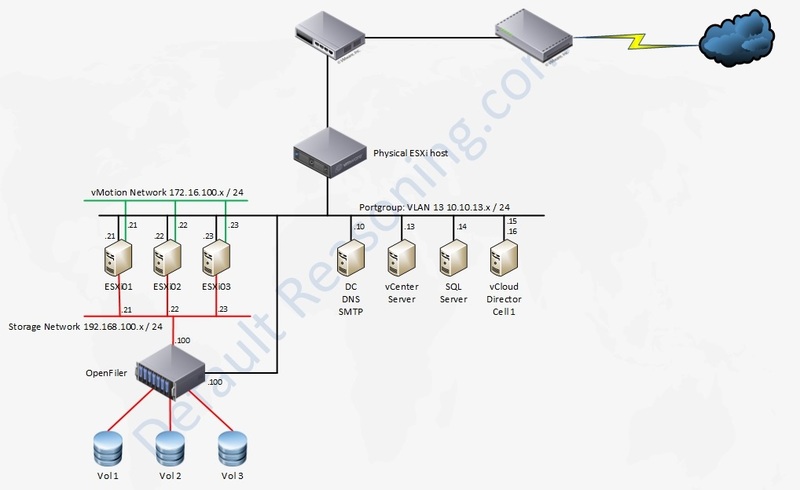 Could you post a picture of the distributed virtual switch of the nested ESXi server. Thanks! Sorry for late response. Settings for the vDS are default, except the security settings. You need to set the Promiscuous Mode to Accept. Also, when you create a new nested ESXi host, check the Hardware Virtualisation option in the vSphere Web Client. if you have nested ESXi hosts already installed, I wrote a quick how-to on enabling this option on existing VMs. Here is the link. I like to thank you for the writeup. Following your directions, I am able to have my vCloud Lab working.